We have a great training planned for you, with a ton a really awesome mentors. Watch this short video about the benefits, and then register! Yesterday we released some updates that fixed a couple bugs you folks had found. So now the search bar should play videos properly, and any volume changes persist between video viewings. Woot! We added a couple other bits behind the scenes as well, but if you were waiting for those fixes, take them for a spin. If you've been following along with this series, you'll be familiar with the idea of variants by your use of the Context module. Variants simply give us a different way to display content in a different context. In this video we start building out our first variant. As part of the process of building our first variant, we have to decide what the layout of the page is going to be. Just like in Display Suite, we can choose from a number of layouts that give us a number of content regions. But, unlike Display Suite, we can easily build our out layout right in Panels, which is what we do in this video with the 'builder' layout. Now that we've added one panel pane for a full node, we look at adding a single field and do a quick review of what we need to do to complete our panel creation. After adding our sidebar to the panel pane, we now have two places where our product info displays. So in this video we jump into our context and turn off the block we added earlier. Something that's surprisingly tricky in Panels is lining up the page title with the sidebar regions of a panel page. In this video, we explain the approach we're going to take. Now that we've hidden the title of the page, we give a go at bringing it back by using one of the default panel panes. Starting with this video, we're going to try a number of techniques that fail, but that will help you get familiar with the Panels user interface and see how easily and quickly we can try different approaches. Last year we had the best selling training at DrupalCon Denver, and this year it's shaping up to look the same. Claim space for you and your team now to take advantage of early bird pricing and get $70 off the ticket price. This training is going to be awesome, and if you have some Drupal you want to learn, we want you to be there to get one-on-one help from a dozen Drupal experts. Plus, receive a free 4-month membership at BuildAModule, saving you even more. Learn more about the training, or REGISTER NOW! Before we get too much further, let's take a quick break and capture our work in a backup. Whew! Okay, now we can can keep going in confidence. Now that you've got a bit of background with the Context module, we explain the details of creating a context, and what a context is actually made of. Understanding the concepts here will also prove useful as we get into Panels, which has it's own very similar contextual system. Once you start using Context, the next logical step might be to standardize on it, and in this video we explain why. Panels is coming up, but because there's a lot of configuration involved that can be inadvertently borked, we're doing a quick backup. Now that you have a taste of what it's like to be a site builder, we take a step back and look at another way of describing what you're doing that might help you both get a sense of the depth of your work and the edges that define it. 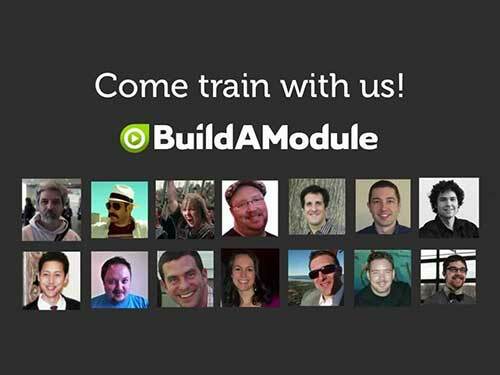 Register for the BuildAModule DrupalCon Training! Work at your own pace and focus on material that's just right for where you are. Just to put a bug in your ear, I'll be presenting a session at DrupalCon called "Powering a Lean Startup With Drupal", in which I'll be talking about some of the principles behind a series of career shifts that lead me to create BuildAModule. I'll also talk about some of the tools and techniques I've used to stay sane and keep motivation up, and how Drupal factors into all of that. If you're interested, be sure to mark it on your schedule as soon as it's slotted for a time. If you're still on the fence about coming to DrupalCon, let me just say that the connections you make there will more than make up for the costs, I guarantee it. Even though that 'submitted by' line gives us some great information about a node, it usually bugs designers to no end. In this video we show you how easy it is to hide this content per content type simply by turning on a Display Suite layout. Something that Display Suite, Panels and Views make relatively easy is injecting custom content into a node display. Here we look at Display Suite's answer to this problem, which is adding a custom code field. We've already talked about the importance of understanding what context you're configuring for, and in this video we get to anchor that concept by looking at how we decide which image style is right for our particular use case. Now that we've made it this far, it's time to back up our work and give ourselves some props. Way to go! After getting our content to display in the theme sidebar region, we saw that there were a few little bits to clean up with its display. In this video we knock those out like Billy the Kid in a shooting gallery. Come to our DrupalCon Training! We'll be doing a training this year at DrupalCon, and it will be pretty dang awesome. We'll have numerous skilled trainers, you'll get 4 months of BuildAModule free, and of course you'll learn a ton. The registration page isn't up yet, but if you're interested, be sure to save May 20th as training day. Get free access on March 15th! 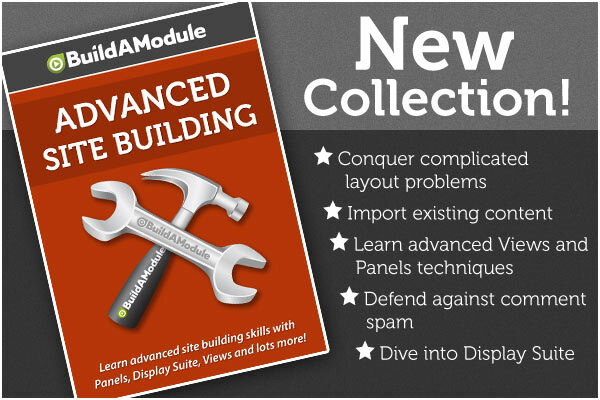 For the Drupal Global Training Day, we're giving away free access to BuildAModule. Just go to this page sometime that day to claim a free 24-hour pass. We'll open it up a bit before and after so you don't have to worry about what time zone you're in. Since our content type is going to need several fivestar fields, we're also going to need to configure some extra 'voting tags'. In this video we talk about the reasoning behind this step and make it happen. As we set up our additional fivestar fields, you might start to feel a bit like a click-monkey. This is a feeling you're going to run into more and more as you build your site building skills. To combat this, it helps to step back and remind ourselves about the power we wield through our sometimes repetitive clicky tasks. In this video we do a couple configuration ninja tricks to get our fivestart rating field looking right. Up until this point we haven't had a lot of choices for how we go about setting things up (besides of course our question about how to split up content into different content types). Now that all changes, and in this video we talk about how. Before we get into the practical implementation of the various methods for positioning and displaying specific fields on a page, we're going to do a quick overview of the methods so you know what we're about to get into. This is a pretty important video to watch if you're just starting to figure out how to lay out information on your site. Here we give you a quick overview of 4 of the most common methods for positioning content once we have it grouped into the fields that we want to display. As we start to dive into the awesome Display Suite, we take a look at the numerous modules that come bundled in the Display Suite package and enable that ones we'll be using throughout this series. One of the hugely useful features of Display Suite is that it gives us the ability to edit our view modes and add new ones. In this video we show you how to enable the manipulation of a view mode and we add a custom view mode for our sidebar product display. Do you want to hear me speak at DrupalCon? Powering a Lean Startup With Drupal - In this session I'll be talking about how you can leverage Drupal to build up the resources you need to launch a startup. I draw from my own experiences moving from employeeship to freelancing to running BuildAModule, and so if you're interested in a bit of backstory on BuildAModule and what ideas you might be able to apply to your own project, post a comment! Laying it All Out With Panels, Display Suite, Views and Panels - An hour session isn't long enough to cover all of these awesome modules fully, but in this session I'll talk about how they overlap and some specific ways to apply each one to various layout problems. This is some of the best of what the "Advanced Site Building" video series is going to cover in the upcoming months. If you're interested, please leave a comment! 10 New Advanced Drupal Site Building Videos! The Coffee module is a nice, quick way to rapidly navigate to any menu page in Drupal using just a couple keystrokes. We're going to use it throughout this series, so here we install it and give you a quick tour. We just created a backup using the default Backup and Migrate settings, but in this video we talk a little bit about what's going on behind the scenes and how we can created regular backups by using a cron job. At some point, your module listing page is going to get ugly and really difficult to scan. The Module Filter module enables you to quickly narrow down the types of modules that are listed, and it also adds some utilities for making sure you don't accidentally turn on and off modules. Modules typically come with a useful README file in the module directory, but because it's hidden away in the directory, it's not always the first place you look when getting help. The Module Instructions module reveals links to it on the module page, making it much more accessible, and in this video we look at how it works. Since we're on the subject of useful administration modules, it makes sense to mention a popular additional called Admin. We'll be revisiting Admin when we start digging into working with Context later on, but for now we'll explain why we're satisfied with the Administration Menu module and Coffee for now. In the coming weeks, we're going to begin releasing videos in our new upcoming collection, "Advanced Site Building". These videos are going to be jam-packed with practical techniques using some of Drupal's most challenging and powerful modules. As we focus on building a corporate site with a couple of key features, we'll look at several ways to lay out content on a page using these tools, exploring which tools are the best fit for different situations. We'll take it even further as we dive into importing existing content into a site, how to configure spam-catching tools, how to re-write virtually any content to prepare for theming and design. As we begin the process of building out our site, we'll also uncover numerous useful administration tools to allow you to build your site more rapidly. This collection is being built as an answer to the many questions we get regularly about how to both use these tools and decide which tools are right for each context. This week we're releasing a short introductory teaser to the series, and new videos will start being released to members over the next couple of weeks. Enjoy! Final videos for PHP Programming Basics released! OOP makes sense in a number of ways, and in this video we talk a bit about how OOP improves on the traditional function-based model by capturing everything into objects. This week we're releasing the final 7 videos in the PHP Programming Basics collection. Woo hoo! I hope you've been enjoying this series as much as I enjoyed putting it together. If you've been following along as we go, these final videos will help you take what you've learned about functions, variables and code organization and apply it to Object Oriented Programming. We don't dive too deep, but we get our feet wet enough so that you'll know that OOP is something that you'll be able to take on without a problem when the need arises. We'll be announcing our next video series in the coming weeks, so stay tuned! As per usual, before we dive into our code improvements, we're going to take the new code for a spin. In this demonstration, you shouldn't see any changes in the way the code performs, but you'll see soon that the backend has undergone some changes. You already know what methods and properties are (they're just functions and variables), but in this video we put them into context with a couple other OOP constructs. In this video we talk about what happens when a new instance of a class is created, and look at mapping some of our original code to the updated OOP code. Properties are simply variables that belong to a class. In this video we talk about how to define and access them within a class. We're not going to dive deep into extending classes here, but no basic intro to OOP would be complete without mentioning how classes can be leveraged by other classes through a technique called 'extending'. A quick video to say thanks for watching and nice work! Before we dive into our last stretch of videos, we're going to talk briefly about what we've accomplished so far with our CMS - and it's been a lot! Even though we've added significant functionality to our site, we're also just scratching the surface when it comes to the features that a more mature CMS like Drupal has to offer. Everything we've done so far to build our custom CMS leads us straight to Drupal's doorstep. By splitting out some of our pages to use the database, and some to use files, we're mirroring exactly what's going on in Drupal behind the scenes. In this video we explain how. There's quite a few things we can do to improve our CMS, and in this video we talk about a few challenges that you should be able to tackle given the PHP skills that you've been building throughout this series. Our last group of videos has to do with Object Oriented Programming, and for many who are new to coding, the concept can be a bit abstract and difficult to put into practice. But for the most part, OOP is just another way of looking at exactly what you've been doing so far with functions and variables, even though the components have different names. In this video we do a quick wrap-up of the amazing progress you've been making when it comes to building out our custom CMS, and talk about a few things you can do to stretch your skillz. In previous videos, we looked at saving information about users and products to the database. Now things get a little crazy, where we look at storing our pages in the database, too. Now that we have our front controller pattern in place, this is actually going to be pretty easy to do. Here we take a look out our page administration in action and give it a spin. Even though we now have the ability to serve up pages from the database, that might not be the ideal method in some cases where we have a lot of logic and would rather use an IDE to manipulate our pages. In this video we explore how we can get the best of both worlds. Knowing that we can serve some pages from the database, and some from files, we now have to decide which pages should go where. Why are we doing so much CRUD?! So if you've been following along with the new video announcements over the last couple of months, it might sound like we're beating this CRUD concept into the ground. But, bear with me, because CRUD is really the foundational basis of any CMS and so it provides a great example to iterate through and create more and more refined versions of. Any PHP code written can be improved, and you really start to learn and hone your skills when you can stick with a single example for a while and continue to improve it. We're sticking with CRUD because so much of what you learn will be transferrable to coding for Drupal, and understanding what's going on under the hood. This is the home stretch, we're almost ready to wrap this up and dive into a new collection. But, before we do there's still a few important concepts to explore. The first step in building out our generalized CRUD system (aren't we done with CRUD yet?!) is creating a way to review our records, so in this step we take a tour of a record listing function we could use to display virtually any type of data just by passing it a few settings. Kind of cool! In this video we take a look at the functions that make up our generalized CRUD script. After taking a look at the record display function, we peek at the function that handles rendering the add and edit forms. No add and edit form function would be complete without a corresponding validation script. In this video, we walk through the validation code. Once we have all the other pieces in place, we take all the data that we've gathered and validated and do something practical with it! This time, when we process the data, we'll do so in a way that we can use to handle nearly any other kind of data we need to insert into the database as well. 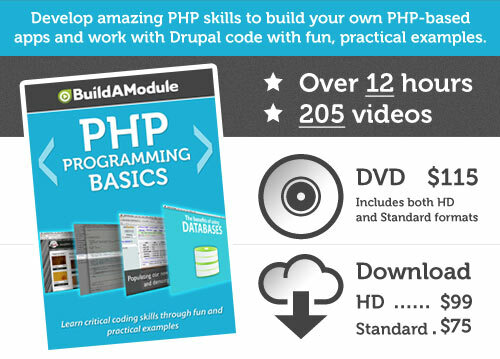 PHP Programming Basics is released on DVD and as a download! After several months of releasing videos to our members, we've finally released the full PHP Programming Basics collection as a DVD and download for offline viewers on-the-go-learners and those that prefer tangible, possible disks to ethereal streaming bits. We have a few weeks left before the full collection is completely released to members, and after that we'll be jumping into an awesome new collection! We've gotten tons of great feedback and suggestions over the course of the year from you, our viewers, and they have been much appreciated. We've incorporated a bunch of the most common requests into the new site's interface, and this next year we'll be tackling many of the video topics that have been requested. We have a great year planned, and look forward to your feedback along the way. After looking at the differences between our product and user CRUD scripts and seeing a ton in common, it's clear that if we can capture the differences into a smaller package, that there's a lot we can re-use between them. In this short video we talk about why this makes a lot of sense. In this video we look at the differences between our two CRUD scripts and see that there's actually a lot in common between them. Now that we're pulling our products from the database, we need to update our code a bit, including using some new SQL syntax. We walk through those updates in this video. In this video, we verify that our updated, generalized CRUD forms work the same way as our previous code. We've talked about using arrays to organize configuration or differences between implementations of scripts that have common functionality. In this video we walk through the aspects of our generalized CRUD code that are different from one implementation to another.